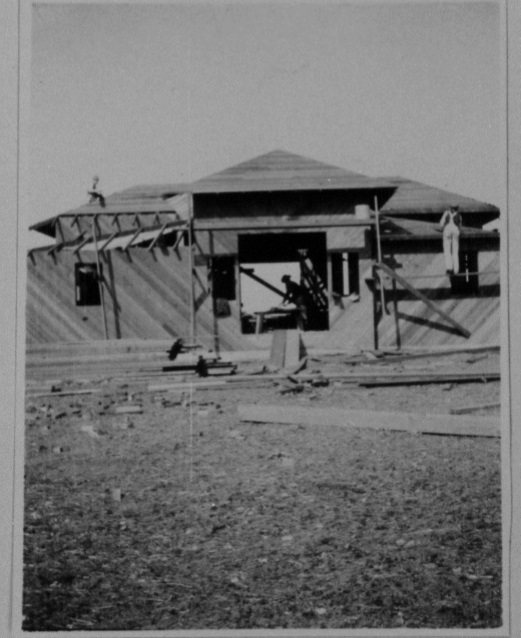 When construction for the Point Cabrillo Light Station began in 1908, there were a number of structures that were slated to be built. There had to be three two-story homes for the Lightkeepers and their families, and additional storage behind each of those homes, as well. The Fog Signal Building and Tower was of course the most important building, along with the Oil House to store the kerosene needed to keep our light going. Directly East of the Oil House, they planned to build our Blacksmith and Carpentry Shop, so that the Lightkeepers could truly support themselves out here on the point. 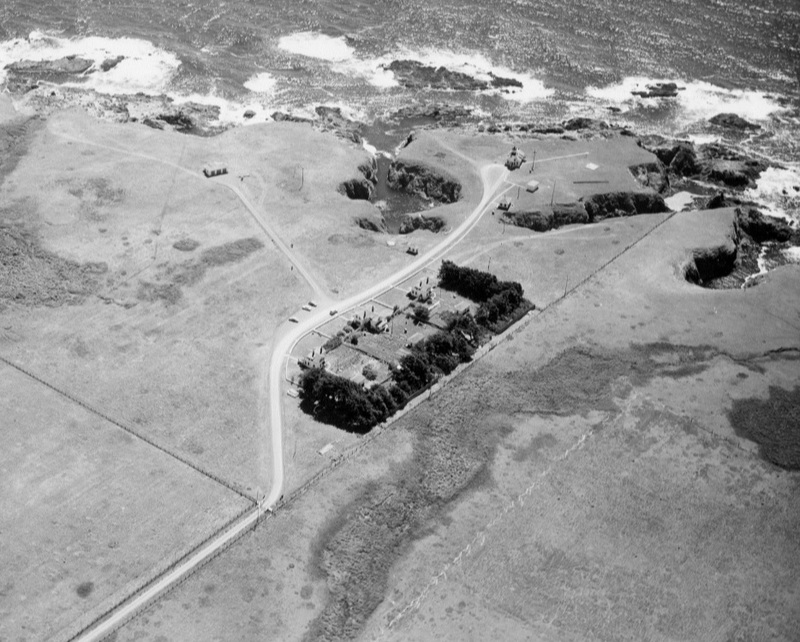 Each of those original buildings is still standing at the Point Cabillo Light Station State Historic Park today, but there is an important structure that our property is missing. When the Light Station was completed and functioning in 1909, there was a barn just south of the Lighthouse and Lightkeepers homes. The Point Cabrillo barn was burned down in 1981 as part of a training exercise by the Mendocino Volunteer Fire Department. It has been a long term goal of the Point Cabrillo Lightkeepers Association to rebuild the Historic Barn on the Point Cabrillo property. When the barn reconstruction project is finished the Light Station will closely adhere to its original design. Rebuilding the barn will make the Point Cabrillo Light Station State Historic Park one of the most complete Historic Light Stations in the country. Rebuilding the barn will allow the Point Cabrillo Light Station to have meeting and event space for our visitors and enhance our educational programs. This barn could be used to host school groups, provide a meeting room, and celebrate weddings and events in any kind of weather. If you’re interested in being a part of re-building the barn, we would love to hear from you! If you’re considering donating time or materials, please contact us through our website. You can also make a donation through our website, or by sending a check to our PO Box in Mendocino. Read below for more specific information regarding the reconstruction of the Historic Barn. This is from a July 2017 project description, by PCLK Board Member, Harold Hauck. 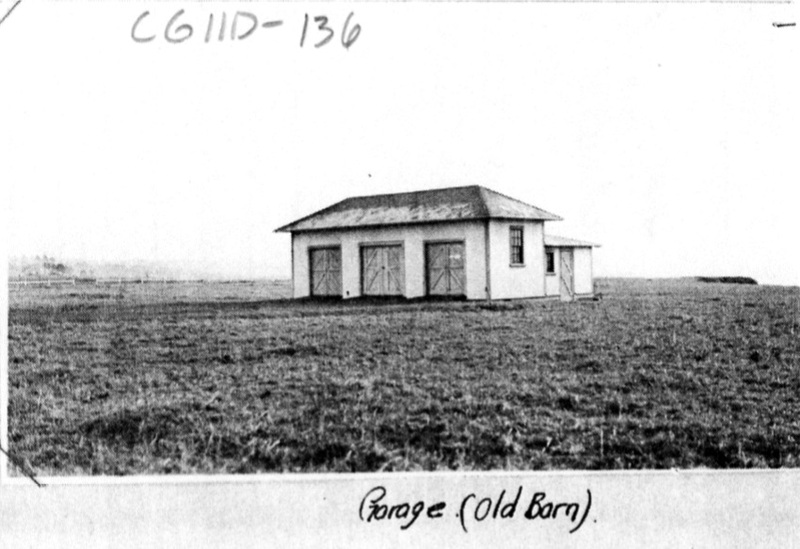 It was not uncommon for light stations in California to have a barn. “Many California light stations were so isolated when first built that all fresh meat and produce consumed by the keepers’ and assistant keepers’ families had to be produced on site” (Bookwalter 1989b: Section F.II:9). 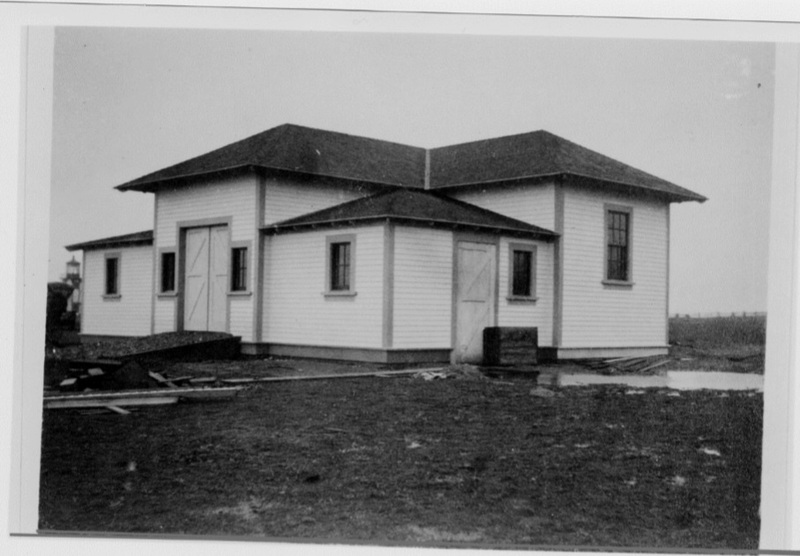 The barn at Point Cabrillo was one of the five buildings (light tower and fog signal building, three houses for the keepers, and a barn) constructed for the Point Cabrillo Light Station by Lindgren and Company of San Francisco to the specifications of the Light-House Board and was completed in 1909. 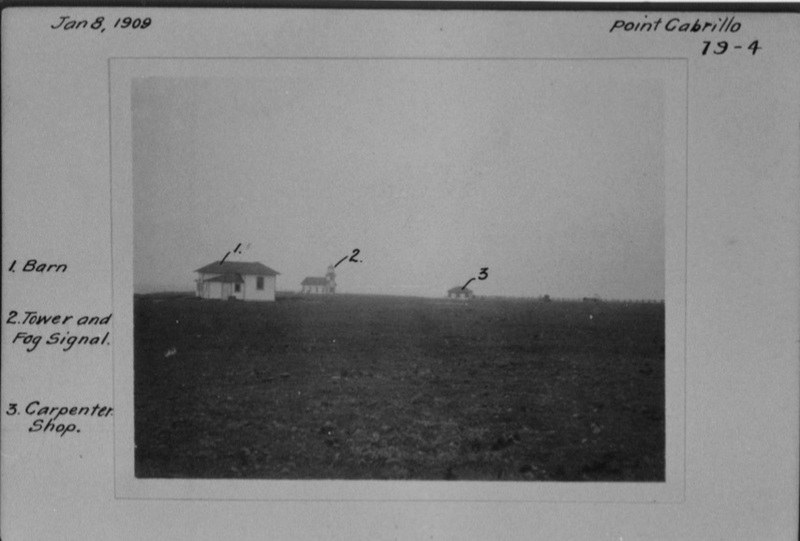 The barn was located at the end of a road that intersected the main light station road about 500 feet to the south of the Keeper’s Quarters. It was located in a large open field that was used for grazing livestock. The wood building was 29 feet by 32 feet. In 1931, the interior of the barn was adapted so that the building could be used as a garage for automobiles. We asked PCLK volunteer Michael J Petherick, Col. USAF (ret.) to fill us in on the use of the barn during this period of time, and his words are below. Additional information about the military use of the barn is available from the web site www.MilitaryMuseum.org. “You’ve asked me to set out what I remember about the ‘Barn’, both from conversations with ex-Air Force members who were stationed here during this time period, and from my, admittedly distant, recollections as an Air Force Intelligence Officer, in Vietnam in the 1960’s. I need to emphasize that none of this information comes from classified sources, nor has it been officially confirmed. During the early part of the Vietnam War, our pilots, Navy and Air Force, were experiencing high casualty rates during raids on the Hanoi/Haiphong targets in North Vietnam. This was the result, in large part, of the effectiveness of the Russian SA2 anti-aircraft missile, guided by the NATO code named Russian ‘Fan Song’ radar. 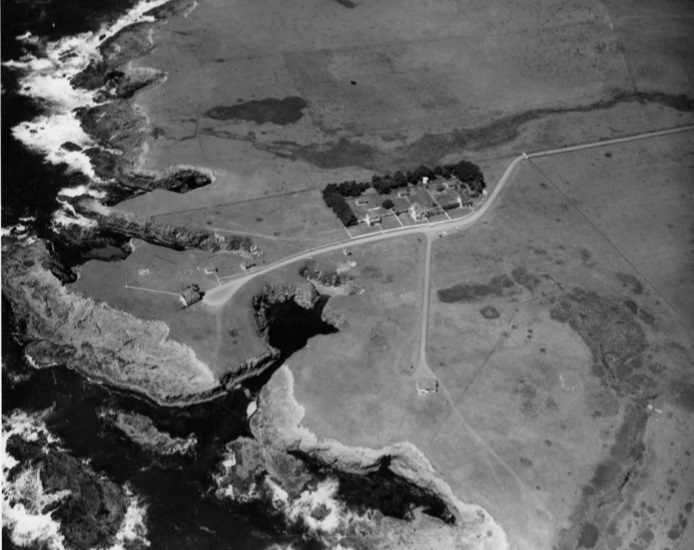 Sometime in the mid to late 1960’s, a Fan Song radar, or one built to mimic the Fan Song, was installed in the Barn at Point Cabrillo Light Station, and was manned by US Air Force Members. Although never confirmed, rumor was that a Fan Song radar had been acquired from one of our allies in the Middle East. 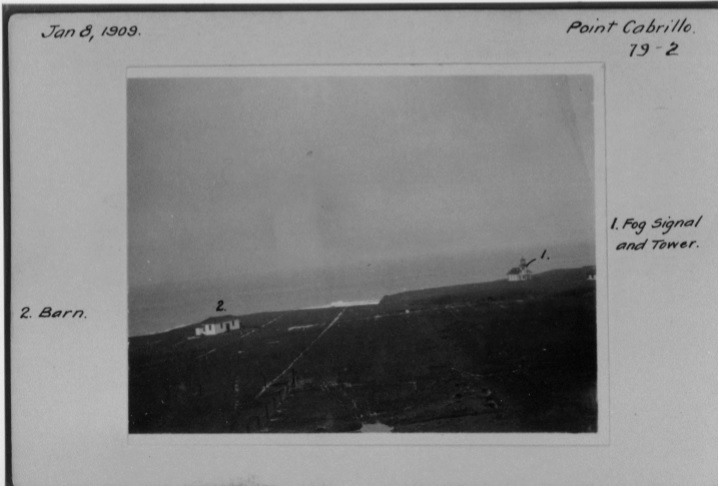 Pilots began flying training missions against the operating radar, making approaches from seaward and staying far enough off-shore that they were seldom noticed. Our casualty rates began to go down, as a result of this training, and the effectiveness of subsequent ‘Wild Weasel’ missions in destroying SA2 missile sites. The part played by a small group of service members, in an unknown location on the North Coast, in saving lives and accomplishing the mission, is another small footnote in history that is gradually fading. Thanks again to Michael J Petherick for sharing the above information with us. In 1972, the U.S. Air force ended their lease and dismantled the temporary structures. In March 1981, the barn was burned as part of a training exercise by the Mendocino Volunteer Fire Department. 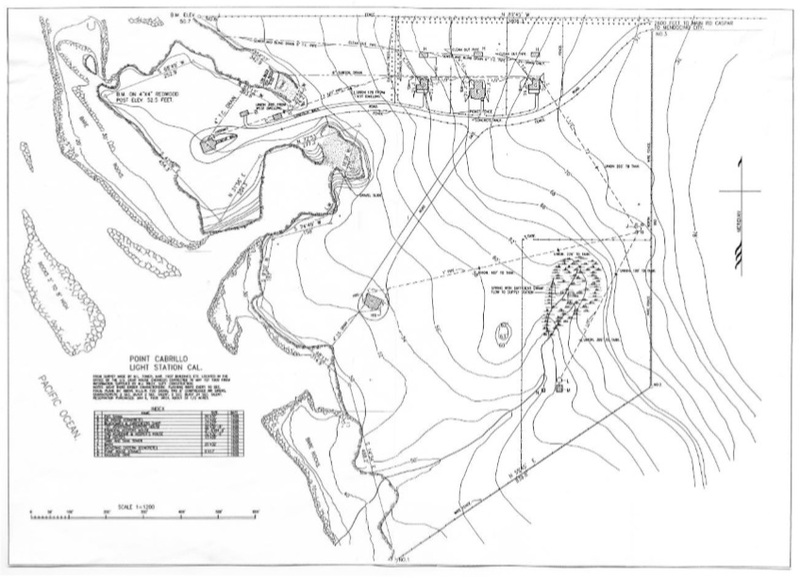 This report was prepared in conjunction with the Point Cabrillo Light Station Historic Structures Report written by Cary and Company in September 2003. 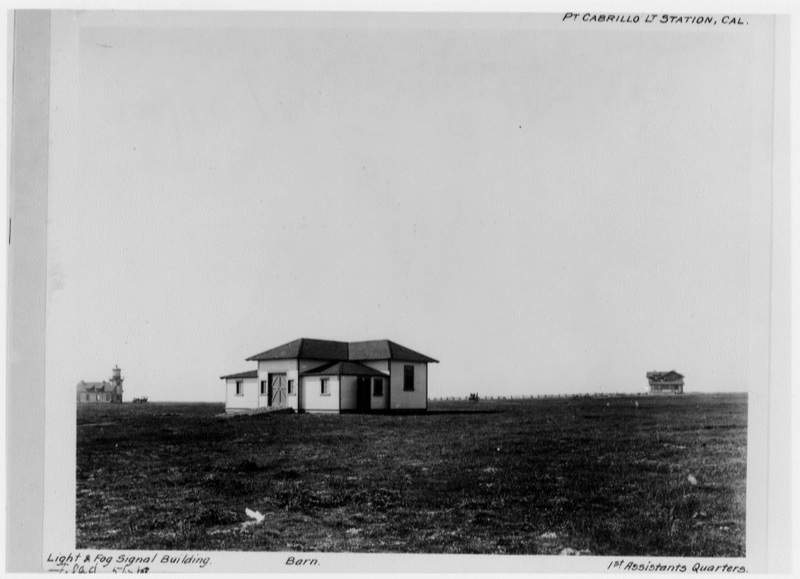 In September 1991 nine buildings at the Point Cabrillo Light Station were approved for inclusion in the National Register of Historic Places. Because the barn had been destroyed in a fire department training exercise in the 1981, it was not included as a historic building eligible for inclusion in the national registrar. However, there is this statement in the NHRP: Registration form, “The only building from the original station no longer extant is the barn.” This statement indicates that the barn would have been an included structure had it been in existence at the time of application. The reconstruction of the historic barn will add to the historic relevance of the site as described for the National Register, and improve the historic accuracy of the site as a California State Historic Park. 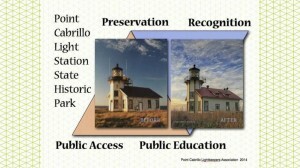 The Point Cabrillo Lightkeepers Association (PCLK) was awarded a restoration and management contract by State Parks for the Point Cabrillo Light Station State Historic Park in 2002. PCLK continues to operate under the authority of that contract. Since completing the restoration of the three houses and their associated outbuildings in 2007, it has been a goal of PCLK working with California State Parks to initiate the planning for and, as funds permit, the reconstruction of the historic barn. 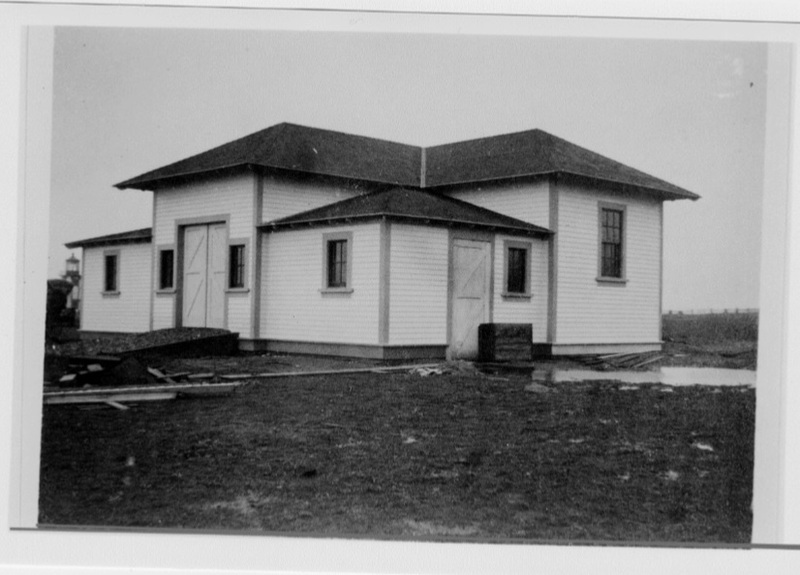 The PCLK plan is to rebuild the barn to its original exterior specifications and dimensions on its original site (see photo, 3a) as depicted in the referenced hyperlinked map and photographs and as described and specified by the hyperlinked copies of the barn plans and drawing. The interior space will be modified from its original layout to provide for an enhanced visitor experience at the State Historic Park. Preliminary dimensioned drawings of the building depicted as a garage were prepared by Debra Lennox in 2004. These drawings may be modified to depict the barn’s original configuration as a barn with one door and two windows on the North side and to present interior changes that may be required to provide for education, meeting, and gathering space use. Other ADA or public safety concerns. The interior will be adaptively reused for educational/community space. Open meeting room space is to be maximized. Interior will feature finished walls and insulation. Two ADA accessible restrooms. If space is limited, one unisex restroom. Kitchen area with sink, serving counter, and appropriate electrical outlets. One wall should be identified as the front wall for presentations/projector use. A storage area for tables/chairs etc. Loft area may be used for storage, and utilities, e.g. forced air heater, hot water, etc.). Utilities, electric, water, sewage, etc. will be provided through connection to existing on site services. Trenching needed for these connections will follow the path of the existing barn road. The barn road will be restored and constructed with appropriate ADA and environmental materials. Barn perimeter area to be open and surfaced according to access and environmental codes. It is PCLK’s intent to assist State Parks with the planning and funding of the studies necessary to obtain the permits and approvals required to construct the barn. After receiving the required permits and approvals, PCLK in cooperation with State Parks will seek the funding required to build the barn through grant applications and other financing opportunities. Click through a few classic photos of the barn below, or donate now!